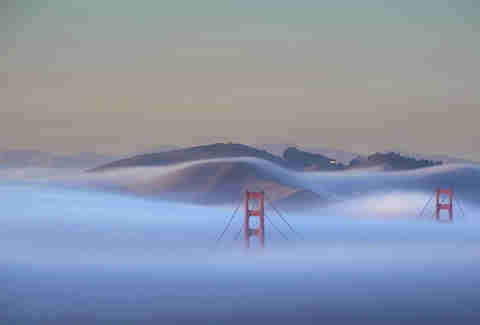 The Golden Gate Bridge: a legendary landmark people come from near and far to admire, cross over, and snap pictures of... Karl the Fog willing. Still, while we fawn over its majestic beauty, even risking killing ourselves to get pictures of the towers while driving beneath them, there's probably a lot that most San Franciscans don't know about their city's most popular tourist attraction. Specifically black and yellow stripes if it were up to the Navy, and red and white stripes if it were up to... Santa? Oh right, the Army Air Corps. That color was originally just the primer, but consulting architect Irving Morrow dug the way it complemented the natural landscape, so it stayed. Joseph Strauss’ first design has been likened to "an upside down rat trap". 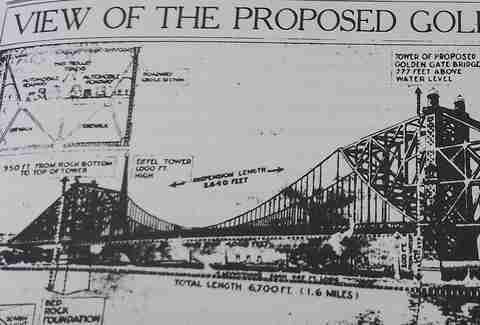 In fact, it was Charles A. Ellis who was the prime designer of the bridge we cross today. Unfortunately, he was unceremoniously fired by Strauss, who then removed all mentions of Ellis’ name in his final report about the bridge. Stay classy, Joseph Strauss. Stay classy. At the equator, in case that wasn't clear. Want to know what the weather’s like? Just look at the bridge. The hotter it is, the lower it will sag. There's just one problem with using that system to decide if you need a sweater, though: the deck is always about two hours behind the actual weather due to the thermal mass of the bridge. SCIENCE, people. SCIENCE. And though you might think there are tons of scientific measurements that go into deciding when the foghorn is activated, turns out it’s just when the human in charge "can’t see the North tower from the toll plaza". 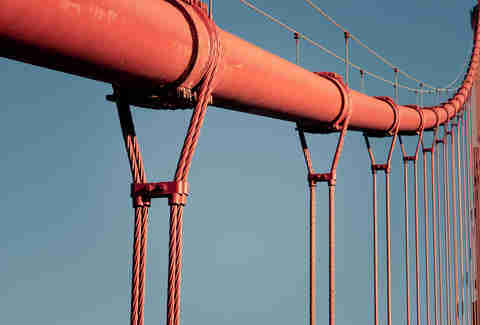 It’s a compressed air line that runs air across the bridge. There's a horn on the South tower and another on the roadway mid-span. The South tower is the one you think of when you think of a foghorn: a deep pitch lasting for two seconds (followed by an 18 second pause). 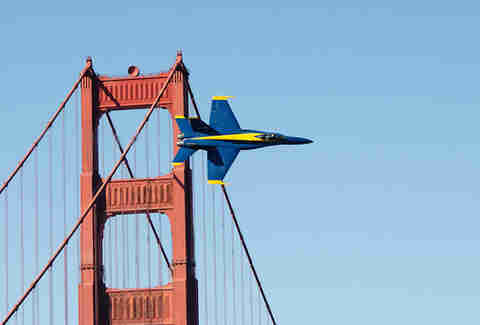 The mid-span horn has a higher pitch. The horns are totally unique to the Golden Gate Bridge and enable ships to steer from the bay into the ocean without crashing into the bridge. Well, that and their navigation. It is 2014 after all. 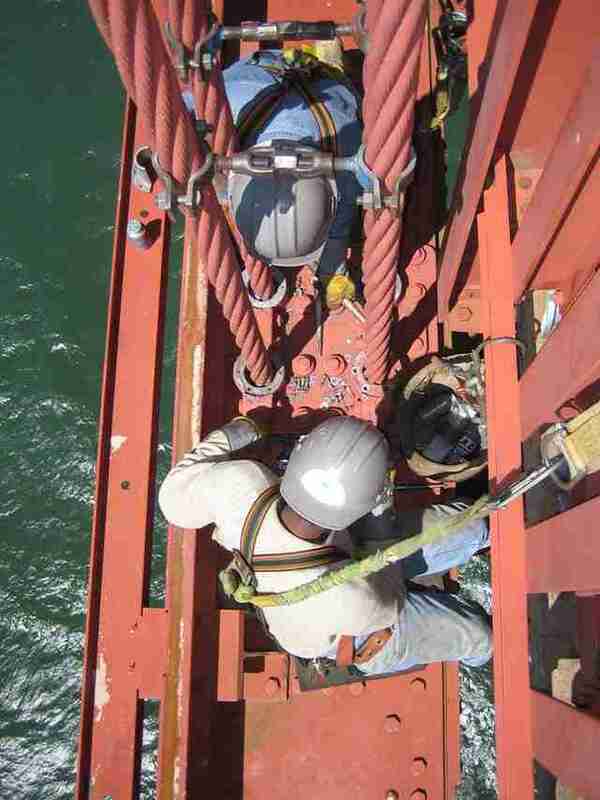 The bridge's electricians run the foghorn because there is always an electrician at the bridge in case of an emergency. However, because of the direction their workshop faces, they can’t actually hear the foghorn when it’s on, so they have the sound play through a speaker. That’s right: you can hear the foghorn four miles away in the Upper Haight, but they can't hear it 50ft away by the toll plaza. 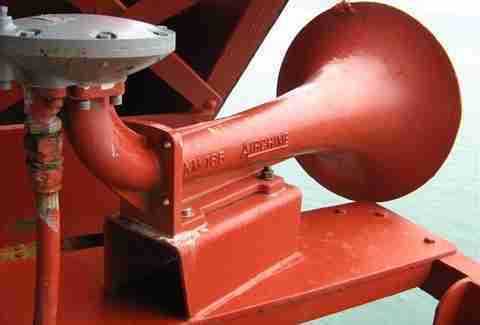 In August of 1992, the foghorns were turned on for 359 consecutive hours. In August. Of course it was. And, once that old paint gets blasted off of the bridge, the zinc primer coat has to go on within one or two days to protect the bridge from corrosion. After that, they can take their time, as even though International Orange was originally the primer, now it’s just a pretty paint color that is currently made by Sherwin-Williams and only sold in extremely large quantities. 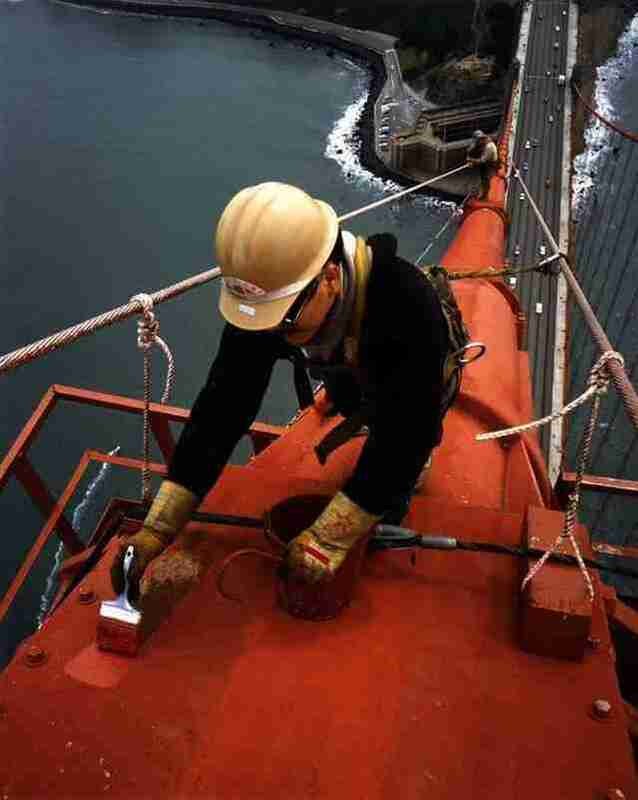 In fact, from the time the bridge was built in 1937 until 1965, only touch-ups were required. After advanced corrosion screwed that up, they removed the original lead-based paint and did a whole bunch of other stuff so that once again, routine touch-ups are the M.O. It’s an engineer’s job to determine when and where those are needed. Oh, and a "touch-up" -- like the one currently being done on the underside of the North end -- can take upwards of five years, so it's just a leeeetle different than fixing that ding on your bumper. 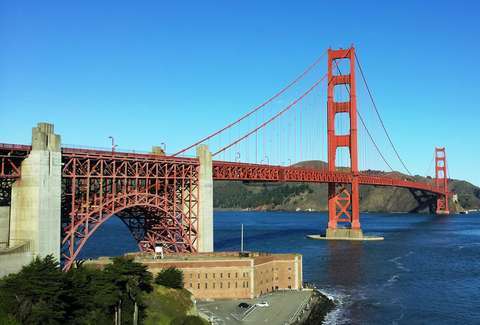 The San Francisco Bay used to be one of our most vital ports, and the crazy bunkers, secret tunnels, and batteries that are dotted along the hills that surround the Golden Gate prove that the military took its protection very seriously. Still, what’s one to do with historic bunkers when they’re no longer in use? Turn them into office space and storage, of course. And though that fact won’t change, as of mid-January 2015, there will be a median barrier on the bridge that will make life a lot easier and safer for the guys who are in charge of moving the lanes. 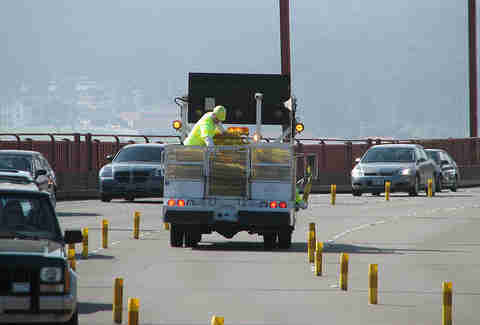 But plan now, because the bridge will be closed on January 10th and 11th for installation. Daisy Barringer is Thrillist's SF Editor and she was one of the 300,000 people stuck for hours in human gridlock on the day the Golden Gate Bridge carried its biggest-ever load: May 24,1987, when it closed to car traffic and allowed humans to cross en masse. Follow her on Twitter @daisy to tell her how glad you are she survived.